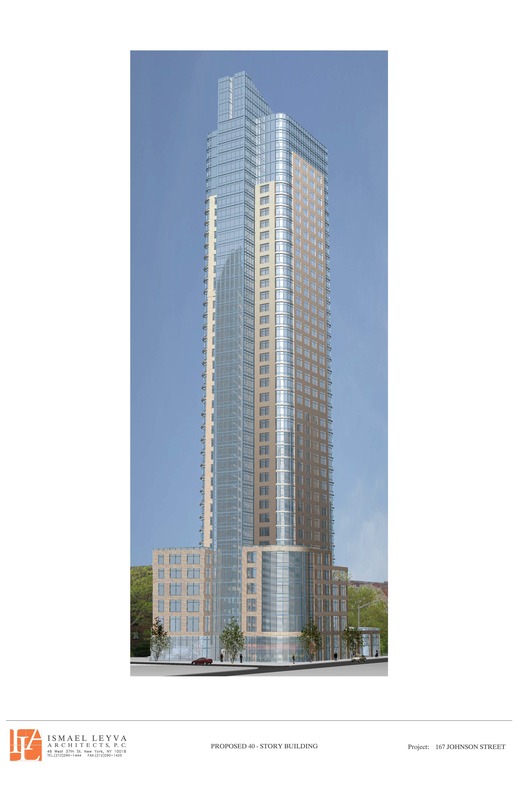 New downtown Brooklyn residential tower will use City air rights. Image: Ismael Leyva, Architects, P.C. Transfer of 75,000 sq.ft. of development rights from City property will increase Brooklyn residential tower. On June 27, 2007, the City Council approved a plan by DCAS to sell 75,000 sq.ft. of air rights from a City-owned property at 287 Gold Street in downtown Brooklyn, containing two, two-story buildings used by the FDNY and the NYPD. The sale of the air rights necessitated Council’s approval of a negative easement limiting the City’s future ability to develop next to the proposed development. With the air rights transfer, developer 167 Johnson Street, LLC will increase the size of the mixed-use building from 35 to 40 stories. The project includes 296 primarily luxury apartment units with ground floor retail. At the hearing before the City Council’s Subcommittee on Planning, Dispositions & Concessions on June 19th, speakers from the New York City Economic Development Corporation, 167 Johnson Street, LLC and the Downtown Brooklyn Partnership testified in favor of the plan. Kenneth Fisher, speaking on behalf of the developer, testified that 20 condominium units in the new development would be set aside for affordable housing. In the original 35-story design, Fisher added, the development provided only nine affordable housing units, all of which would be built off-site. Fisher explained that the average price for a condominium unit in the development will be approximately $750,000, but the affordable housing units, which will target 110 percent of the area median income, will run from $165,000 to $205,000. At the request of Council Member James, the subcommittee postponed its vote until June 25th. Following the hearing, the Mayor’s Office agreed to finance 20 additional affordable units at a nearby site. The subcommittee approved, sending it to the full Council, which voted 48-0-4 to approve.